The most-searched thing that brings readers to this little blog (besides "naked freckled girls," obviously) is green chile stew. I blame the siren song of green chile. Once you're hooked, you are hooked. I hope those folks got the fix they needed with my Missing New Mexico Green Chile Stew. Last night on Twitter, I heard about another person answering the call of the hot green stuff via my recipe. In return, I promised Suzie a recipe today to accompany her pot of stew, and since I'm a woman of my word, here it is: Blue Corn Muffins with Chile and Cheese. I've made these countless times, and they're always a hit. They're from The Santa Fe School of Cooking Cookbook, a really fantastic book (the fall vegetable stew on page 56 is a regular in my rotation). We actually just made these over the weekend, along with a pot of Four Chile Chili (another recipe I highly recommend, by the way), and took dinner over to our friends with a newborn. The chili was well-received, but these muffins were what they couldn't stop talking about. 2. In the bowl of an electric mixer, cream together the butter and sugar until smooth. 3. In another bowl, mix together the dry ingredients. Add the dry ingredients to the butter and sugar. 4. In a separate bowl, whisk together the eggs and buttermilk. Slowly mix wet ingredients into the dry ingredients. 5. Stir in the corn, cheese, chiles and mix well. Spoon the batter into muffin tins. Bake about 25 minutes, until just firm. Serve warm with butter. *I'm addicted to my extra-large red silicone muffin "pan," so I skip greasing/lining, and then rejoice when my jumbo-size hot muffins pop right out of the mold when they're done. Those sound wonderful! Makes me miss New Mexico. :( And warm green chili stew on a cold night. Question- can I use diced green chile from a (bows her head in shame) can? So until then, I say give canned chile a try, and then make the muffins again when we go on one of our Southern food snob/literati trips and I bring you some of my green chile stash, so you can begin an addiction of your own. Ughhh you're killing me. I'm going through serious Santa Fe withdrawls. THANK YOU! I've been looking forward to this all day! For Samma - we sent some friends in Seattle green chiles last fall and they made it just fine so we've had good experience with the distributors. I plan to try making these this weekend with a few tweaks for my gluten/egg allergy - can't wait! You know I think you have fabulous taste, and this is solid proof. I made a few little changes (used canned green chiles, but they were Hatch, does that give me a tiny bit of cred back?! and yellow cornmeal).. but OMG yum. It's taking every ounce of my willpower not to eat the 11 remaining muffins before dinner. YUMYUMYUMYUMMMMMM. Perfect- frozen sounds great. You are killing me with your whole foods reference though, because I do not have one here in East Tennessee. It is one of the great tragedies of my life curretnly (yes, I have a nice life). 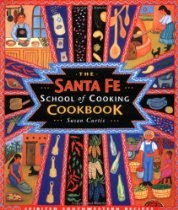 One of the best times my husband and I ever had in Santa Fe was going on the walking restaurant tour that the Santa Fe School of Cooking does. We started at 2 in the afternoon with an appetizer and a glass of wine at the school and progressed from there to 4 other downtown restaurants. At each, the chef came out to greet us with another house specialty and another glass of wine. He would talk to us about the restaurant, history, food and it was all delicious. Can't wait to try both recipes - thank you so much for posting them! I'm drooling as I read this and bookmark the recipe for next week. Are you there, Best Self? It's me, Margaret.